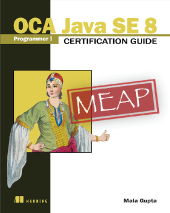 Manning wrote: OCA Java SE 8 Programmer I Certification Guide prepares you for the 1Z0-808 with complete coverage of the exam. You'll explore important Java topics as you systematically learn what's required to successfully pass the test. After the reading Mala's extremely popular previous Certification Guide for OCA Java SE 7 exam, I did not expect to see more of an improvement this time, but it seems Mala found the way how to raise the bar once again. 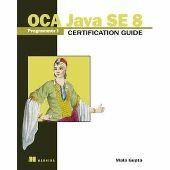 Mala starts her certification guide with an extensive introduction about the OCA Java SE 8 Programmer I Exam as quite often for the students arise such questions as: "Will it be on the exam? ", "Do I need to know this? ", "Are the questions going to be in the form of...? ", "How deep I need to understand...?" and similar. I think Mala perfectly clears these doubts right at the beginning of the book in FAQ form and general explanation, so students reading the book could fully concentrate on the exam's actual content without distracting themselves. 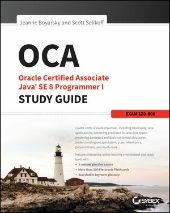 As an extra, for the readers who'll be willing to go for further Java certifications, can find a nice roadmap chart, which clearly illustrates a further certification road and its prerequisites. Going further through each of the chapter, I was pleasantly surprised and liked book author's idea about the content of tiny NOTE sections. We all know that certification isn't always about good programming practices, so those NOTE sections let you be aware which coding style should be avoided in real world, and at the same time give some good advices instead. Across the book Mala uses quite a lot nice illustrations to visualise concepts which are crucial to understand and some ideas even wraps to a small stories, so it would be easier to remember. Having said that, content in the book is well in details explained, where each chapter at the end contains important points summary and the exam type questions followed by the answers with explanation of each (wrong and correct ones). From time to time author does some extra steps forward and explains concepts more widely in terms of content, even though it is not going to be on exam, but it is equally useful to understand as for a Java programmer. Finally, as befits for a good certification guide, Mala constructed and provided a whole mock exam, which is close to a real one, so you can practice and be ready when the day comes. Disclosure: I received a complimentary eBook of this book from the publisher for reviewing it on behalf of CodeRanch. This is the first time I read much admired OCAJP certification book written by Mala Gupta so was excited to peruse It. Note that you have to have basic knowledge of Java to understand the book. At first glance you see an illustration of a lady on the book cover which made me curious to know more about It, which is gracefully revealed later in about the cover illustration section, was quite interesting to know about It. As you commence reading the book, in about this book section you will find an explanation on how to use the book to get the most out of It. Since author recommends a structured approach to preparing for this exam ensuing you get very detailed information about the exam in the form of a chapter based exam objective map, well organised in tables where we get the clear idea of exam objectives with relevant chapters. FAQ section answers all the question that comes to the mind of aspirant who is preparing for the exam. Next section let us know the education and immense industrial experience of the author besides that It also states that the author is a firm believer in creativity, innovation and design which can be seen the way each concept is explained in the book with the help of pictorial representation, comic strips to help you retain read information longer, diagrams and images with highlighted line of code to draw your attention to that specific line of code which kept my interest alive till I encounter the appendix section of the book because I too adore drawing the diagram whenever necessary to understand the concepts. For an example Figure 2.15 named Assigning bigger value to a variable capable of storing a smaller value range, which shows a picture of a guy trying to fit himself in a smaller container, I find the figure funny as well as informative which you will never forget. Author also narrates her real time experience, how preparing for the certification helped her to debug a Java application. In every chapter you will see callouts talking about objectives which are covered in each section, you will also be informed which points are not included in the exam which will make you clear which concepts to emphasize most on. Author used UML diagrams whenever necessary to make us understand the concept more clearly. I’m quite impressed to see the Note section which talks about good programming practices in real-life project, what is not on the exam and much more, also the review notes which I too use in my documentation to highlight the important points of chapter Or any concept I read. At the end of each chapter you get the exam questions which follows real exam pattern to acquaint you with the real exam. Ultimately the book lived up to Its reputation as well as my expectation. Disclosure: I won a complimentary eBook of this book in the book promotion which frequently held at CodeRanch.